Rec. December 2004, Teldex Studio Berlin. Originally released to much acclaim in 2007, this recording has lost none of its energetic sheen in the intervening decade or so. It appears repackaged as a Musique D'Abord reissue in a slimline card case but with respectable booklet notes by Bernhard Schrammer, the disc now one of those mysterious black CDs that tries to look like a LP. Pioneering violinist and composer Pietro Antonio Locatelli worked as a travelling virtuoso before settling in Amsterdam, in his day the main centre of music printing and publishing. His concertos are modelled on those of Corelli, but with added complexities and plenty of harmonic ‘scrunch’ to keep the sap flowing. 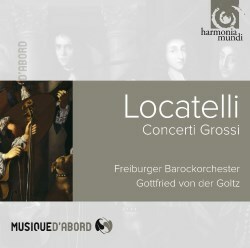 These recordings with the Freiburger Barockorchester give a nice balance between the concertino soloists and the bigger ‘concerto grosso’ or ripieno group, which means not only the necessary call and response effects but also an attractive swelling of scale in the sound as the main group kicks in. Exquisite works such as the Concerto VIII have a magical equilibrium between detail, separating each line and timbre of the instruments, while at the same time creating a compelling sonic picture which keeps bringing me back for more. The only real shame with this recording is that it isn’t a complete set of the Op. 1 Concerti Grossi, but I’m happy to live with it the way it is. Competitors can be found all over the place of course, but few equal the quality on show here. Capella Istropolitana is good on Naxos (review) but puts greater separation between solo and ensemble, removing too much of that delicious tension that I hear with the Freiburg players. La Folia Barocca on Velut Luna Records (review) is also quite fine, though with a more intimate, chamber-music perspective that gives the music added charm and fragility while missing the grand sense of contrast created on the Harmonia Mundi recording. As far as I’m concerned, the Freiburger Barockorchester directed by Gottfried von der Goltz can proudly consider itself still at the top of a big wobbly heap of alternatives. Even if you already have recordings and think you know these concertos, this recording is very much an ear-opener.